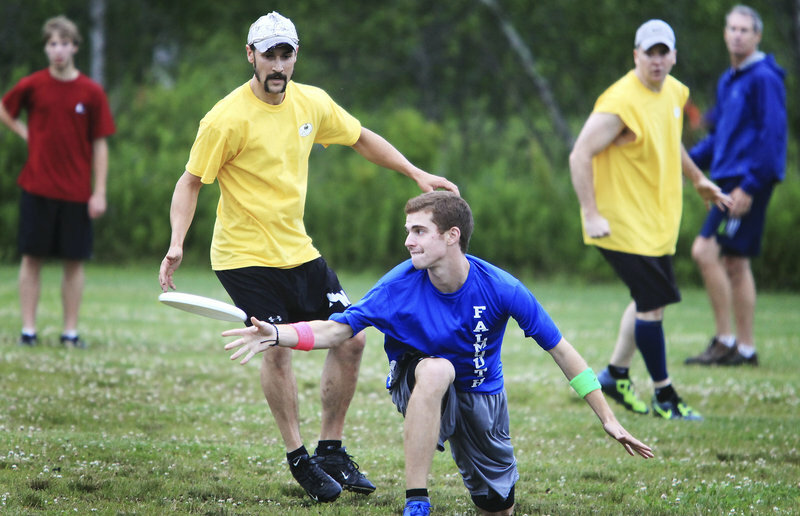 A southern Maine ultimate Frisbee team plays against adults while preparing for a national event. SOUTH PORTLAND – The teenagers were faster. They were taller and more athletic, too. And yet they couldn’t match the experience of the adults who opposed them on a recent weeknight at the sprawling Wainwright Fields Athletic Complex. The Rising Tide, as the kids are known, lost 15-12 in ultimate Frisbee to a team sponsored by Gritty McDuff’s. 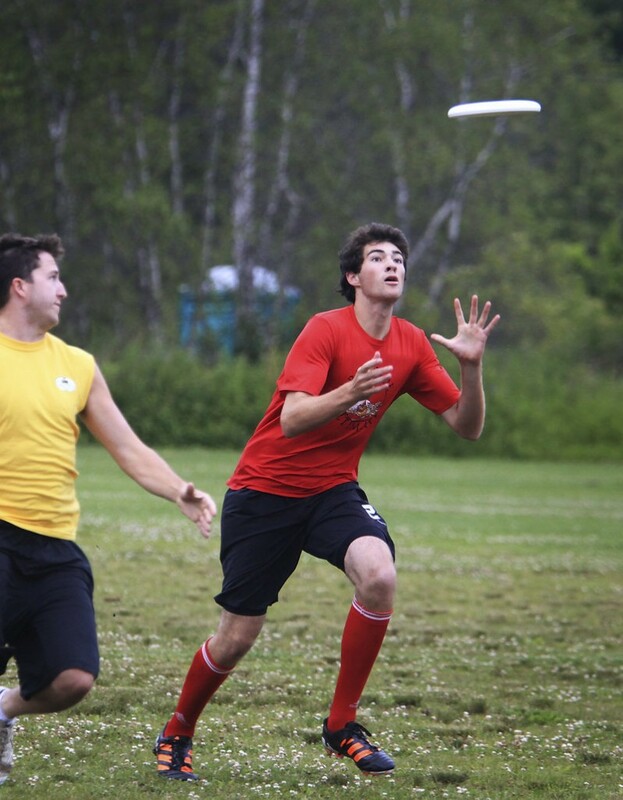 Thomas Robinson of Cape Elizabeth goes for the catch for the Rising Tide, who are preparing for a national ultimate Frisbee youth tournament. 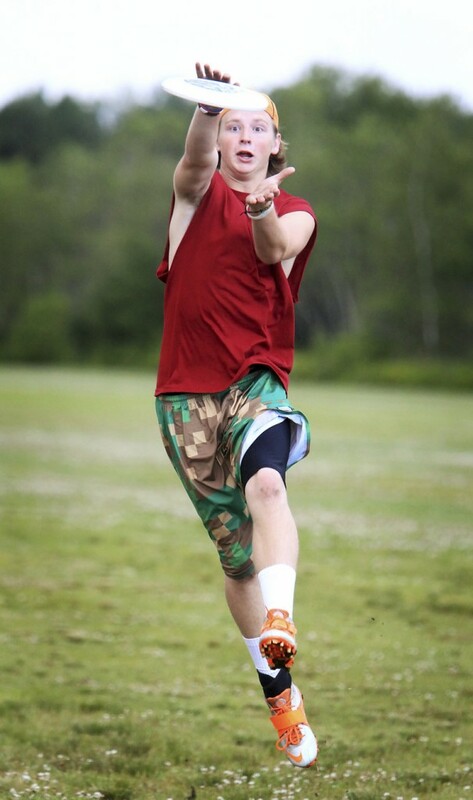 Tom Edmonds of Falmouth sends the Frisbee down the field. Once a catch is made, a player has 10 seconds to throw it or the team will lose possession. Babcock is one of two dozen teenagers who are either in high school or about to start college who play for the Rising Tide, the only youth team in the adult Portland Ultimate summer league. An all-star team that includes boys and girls from seven high schools, the Rising Tide are training to compete in the national youth club championships Aug. 11-12 in Blaine, Minn. Never before has Maine sent a youth Frisbee team to a national event. Neither officials nor elaborate gear is needed for ultimate. Shorts, T-shirts and cleats are about it, along with a healthy set of lungs and a zest for running. Coordination is a plus, along with the ability to throw a Frisbee from either side of your body, unfurling a backhand or flicking a forehand. In a spring high school league, Merriconeag won the “Spirit of the Game” award four years in a row. Fryeburg Academy is the state champion, defeating Cape Elizabeth in the final. Falmouth won the 2011 title. Richard Young, who coaches Merriconeag and the Rising Tide, said ultimate is the fastest-growing team sport in the country, according to a 2009 report by the Sporting Goods Manufacturer Association. This spring the Maine High School Ultimate League expanded to 21 teams, stretching from Islesboro to Scarborough on the coast and with Fryeburg Academy, to the western border. The Rising Tide practices four hours each Sunday, works out at the Maine Academy of Gymnastics on Monday nights, and plays in the adult summer league on Tuesday and Thursday nights. Monday night workouts are designed to increase flexibility and strength, and teach the fundamentals of falling safely. Ultimate is a seven-on-seven game played with a plastic disc on a field 40 yards wide and 120 yards long. The object is to catch the disc in the opposing end zone. As with hockey or basketball, any turnover — usually an intercepted or dropped disc, but also a pass out of bounds or a player holding the disc for more than 10 seconds — results in an immediate change of possession and transition from offense to defense. Against a Gritty’s zone defense, the Rising Tide used a disciplined offensive strategy, using short, quick passes to each sideline and back to the middle, reminiscent of a basketball team methodically attempting to break a full-court press without worrying about a clock. Occasionally the disc would go to one of the four cutters spread across the field racing back, and then away from the three handlers in the rear. Rising Tide took a 3-6 summer league record into July. Because the team will compete in the coed division in Minnesota, the seven players on the field consist of four boys and three girls; the adult club teams occasionally use a lineup with two women and five men. Fifteen members of the Rising Tide are graduating seniors and most, if not all, plan to continue playing in college. Experience counts. Come August, the Rising Tide hope to have a lot more of it when they face teams their own age.